FC Barcelona continued their winning ways with a 5-1 hammering of Real Madrid at the Camp Nou. Without Messi, the Blaugrana raced to a 2-0 first half lead courtesy of goals from Coutinho and Suárez from the spot. Marcelo pulled one back for Madrid before Suárez scored a brace and substitute Arturo Vidal headed in the final goal for the 5-1 victory. Next up is their first Copa del Rey match of the day. FC Barcelona faced Real Madrid at the Camp Nou in front of over 93,000 fans today, with Lionel Messi being one of the spectators in attendance. Ernesto Valverde’s lineup consisted of Ter Stegen in goal with a back four of Sergi Roberto, Piqué, Lenglet, and Jordi Alba. The midfield saw Busquets, Rakitic, Arthur supporting Rafinha, Coutinho and Luis Suárez up front. It didn’t take long for the Blaugrana to strike first blood. After 11 minutes, Philippe Coutinho gave Barça the lead thanks to a well-timed Jordi Alba cross that saw the Brazilian slot it past Madrid’s keeper, Thibaut Courtois. In the 30th minute, VAR was used to show that Raphael Varane had brought down Luis Suárez inside the box. The Uruguayan converted from the spot to make it 2-0 although he could have added more before the halftime whistle. The second half saw Varane subbed out for Lucas Vázquez and Madrid came out the stronger side after the break. Just five minutes into the second half, Marcelo pulled one back for Madrid after some sloppy defending by the Blaugrana. Barcelona was backpedaling and Valverde decided to make some changes by bringing on Semedo for Rafinha in the 68th minute, which allowed Sergi Roberto to roam forward and then brought on Dembélé for Coutinho in the 73rd minute. The changes would pay dividends because a minute after Dembélé’s introduction, Suárez headed in Sergi Roberto’s cross to restore their two-goal lead. Suárez then got his hat-trick in the 83rd minute courtesy of a superb finish over Courtois. Arturo Vidal then came in for the excellent Arthur and four minutes later would head in the fifth and final goal for the historic result. 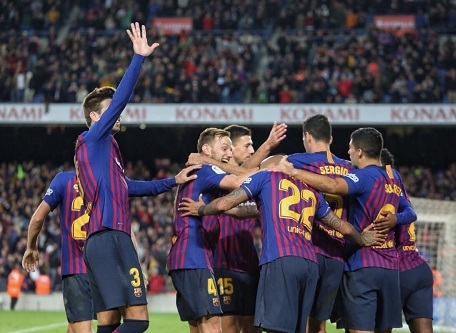 Barça will get to celebrate being league leaders again and now will shift their attention to the Copa del Rey competition which kicks off this Wednesday when they travel to face Cultural Leonesa in their first leg of their encounter before then traveling to Madrid over the weekend to face Rayo Vallecano in league play. Previous PostBarça remain perfect with 2-0 victory over Inter. Next PostFC Barcelona defeat Cultural Leonesa 1-0 to kick off Copa campaign.